Mason jars can easily serve as inexpensive vases for your wedding centerpieces. They can also add different effects to your guest tables, depending on how you decorate or fill them with. Here are six different techniques you can use. 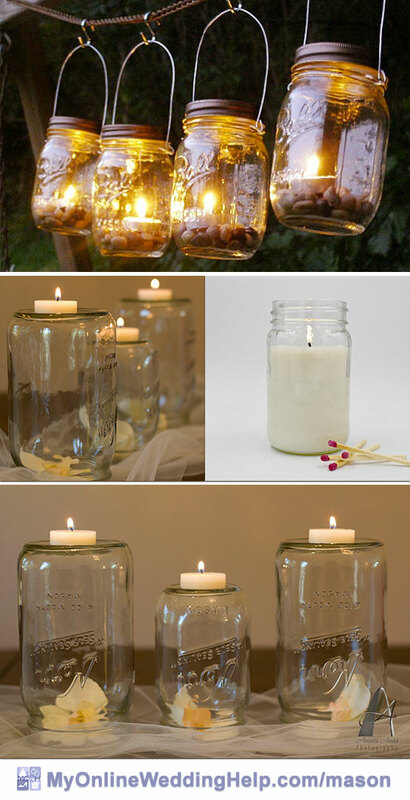 Followed by 19 mason jar centerpiece ideas for weddings and other events. You will also find a few simple DIY tutorials mixed in with other jars or centerpieces you may buy. Note: As with most links on MyOnlineWeddingHelp.com, many of the links in this post go to this site’s shop section or directly to another website. My Online Wedding Help will receive a small commission from the merchant if you click and buy a product. With Flowers. <– Click to see examples further down in this post. You do not need me to tell you that putting flowers into the jar can make beautiful centerpieces. Decorated With Burlap and Lace. Combined, these two fabrics are simultaneously elegant and rustic. With Candles Inside. Ambience is the key element created by candlelight shining softly through clear glass. Filled with Beauty. You are limited only by your imagination when filling mason jars with decor. Painted. It is amazing how applying paint can create a variety of different looks. With Photos Inside. Add pictures and you’ve instantly personalized your centerpieces. Adorned With Glitter. Who doesn’t love sparkle? You can create different bling-filled looks. And, yes, there are ways to keep those pesky flecks off their surroundings. 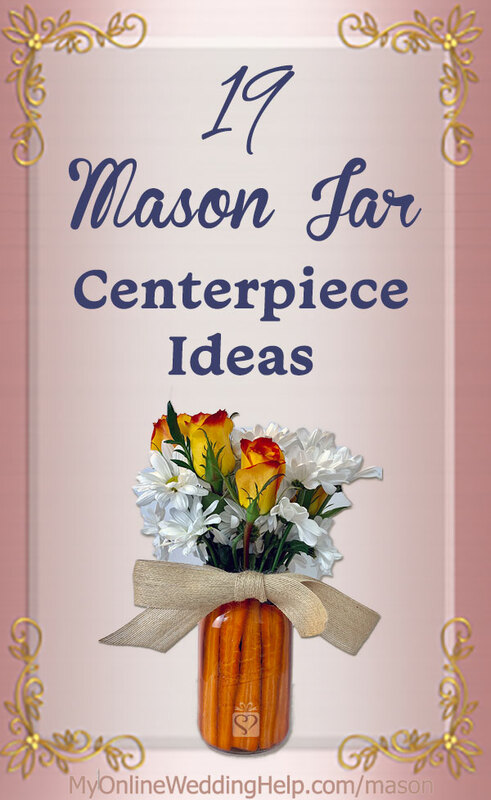 It is no stretch to imagine a mason jar as vase. You can use fresh flowers as I did in the bottom right arrangement. But paper, wood, silk, and other faux flowers are lovely as well. Top: Megan created this centerpiece from four pint size jars. The twine and distressed details make these perfect for a rustic or vintage style wedding. Flowers are not included, but she has several photos with different types. Take a look for more information or to buy the jars. Bottom Left: Jamie and Zach construct the unique roses and peonies in this arrangement from paper. This piece is a lovely neutral, but they can also do custom creations just for you. 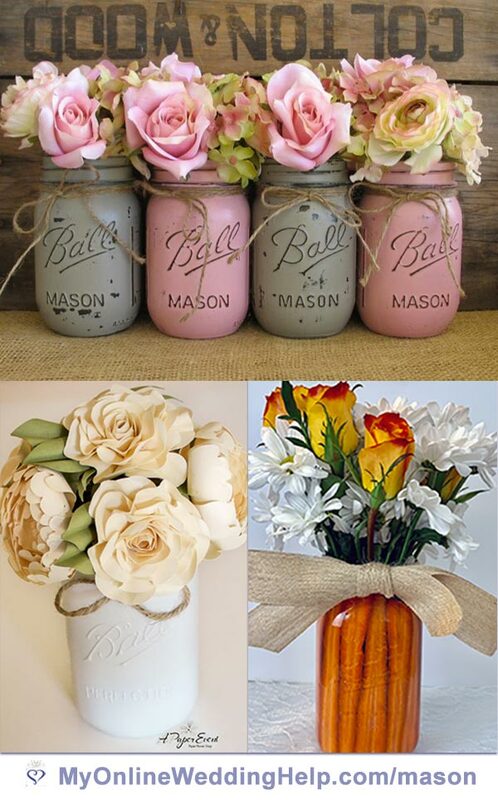 Bottom Right: Here, I’ve combined the “filled mason jars” approach with flowers. This centerpiece is ideal for a Spring or Easter wedding and is easy to create. First, a disclaimer: My “rule” is to only show DIY that I can do myself because I’m not good at crafts and I don’t want to give the impression that I am. More importantly, I want the projects here on MyOnlineWeddingHelp.com to be easy, so anyone can do them. 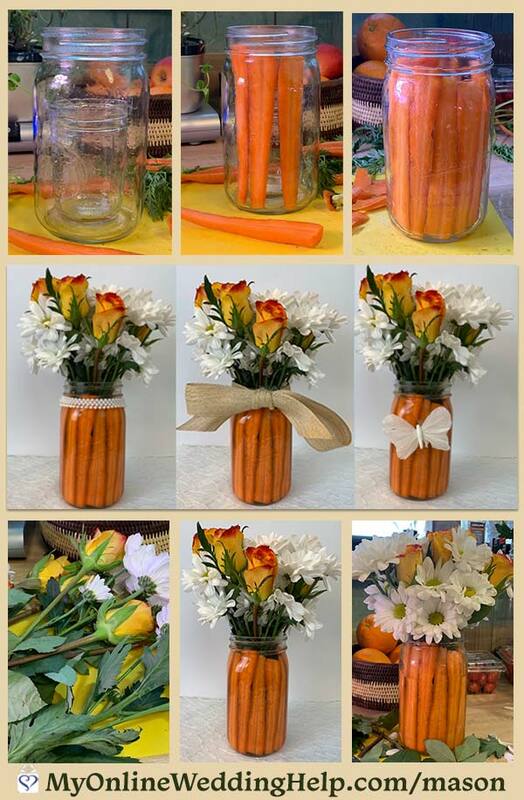 Step 1: Cut carrots to the length of the inside of your large mason jar. Then cut in half lengthwise, so you have long half-round carrots. Step 2: Place the jelly jar inside your quart mason jar. The jelly jar is for flower stems. The space between the double walls is for carrots. Step 3: Place carrots vertically, cut-side out, around the inside of the quart jar. Alternate between thick end up and thick end down so there are no spaces between the carrots. Quite likely, you will need to shave off part of the rounded side to get them to fit. Most of mine were more like carrot planks than half-carrots. Step 4: Fill the jars with water and place a little flower preserver inside the jelly jar. Step 5: Separate your flowers and cut the stems at an angle. I cut them so they were a little less than twice the height of the quart jar. Step 6: Arrange the flowers. Begin with those that will make up most of the arrangement. Place them inside the jelly jar, criss-crossing stems. Next, add the secondary flowers. Arrange as you’d like. I know you can do better than I did! Step 7: Tie a burlap ribbon bow around the neck of the quart jar. Probably a smaller bow would than mine would look better. Be creative and use whatever decorations you like. That’s all there is to it. You’re done! If you agree decorations made from burlap are the ultimate in rustic decor, you will love these looks. Each of these takes a different approach. Top: These are my favorite. 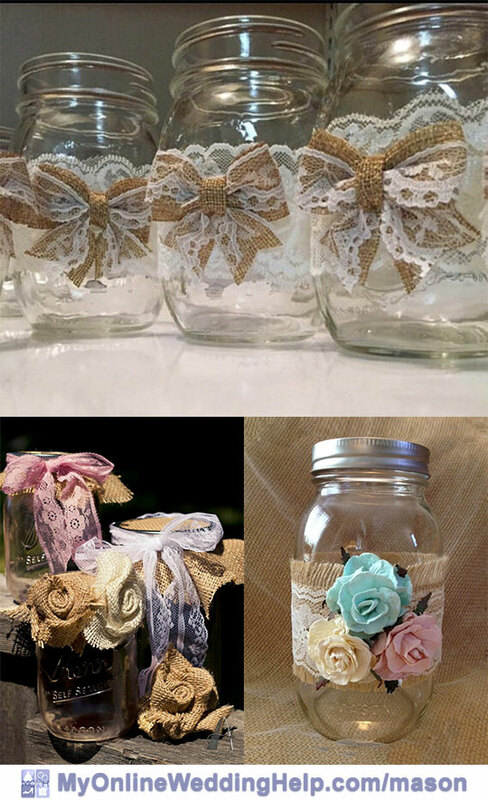 Courtney wraps 12 ounce jars with scalloped lace and attaches an elegant burlap and lace bow to each. These would go equally well in a barn wedding or for decorating a more formal affair with rustic touches. She sells these in sets of five, with discounts on larger purchases. Bottom Left: This is my DIY version. This centerpiece is the exception. I’d get a headache trying to make those rosettes. In fact, I could barely thread the jar lids over the burlap! Fortunately, if you would like, you can purchase burlap flowers instead of making them. The Bows: These are just lace trim wrapped around the metal ring and tied. The Tops: Cut burlap into squares and place over the top of an open jar. Then, using the ring only (recycle the flat metal seal), thread the lid on over the burlap so the fabric is secured between the jar and the lid. The Rosettes: Shop here or discover your favorite tutorial on my “make burlap flowers” inspiration board on Pinterest. Bottom Right: Tutti Rose creates an English country garden effect by adorning a burlap and lace wrap with pastel roses. These quart size jars are sold individually. Centerpieces with candles radiate a soft light, bathing your event in a romantic glow. Here are three different ways to incorporate them into canning jars: (1) put the candle inside, (2) set the candle on top of an overturned jar, or (3) make the jar itself the candle. Top: Shannie fashions rustic wire into handles for pint jars and tops them with ornamental lids. You add tea lights or votives, along with any other decorations you choose. Use these as hanging centerpieces over tables, set them on guest tables, or use as other decorations. She sells these in sets of four. Middle Left and Bottom: These “upside down” centerpieces are super easy to create. I imagine them on long tables (i.e. with banquet seating) or grouped together on round guest tables. Simply assemble the pieces and instant decorations! Lay your tulle or other fabric in the center of each table, then place upside down mason jars over blooms. Set tea light on top and you are done. Middle Right: Stuart hand pours these soy wax candles in a way that assures even burning from top to bottom. And with 85 hours of light from each candle, these can easily do double duty as favors or door prizes for guests to take home. You can buy individually or purchase in sets of 12 for the best value. 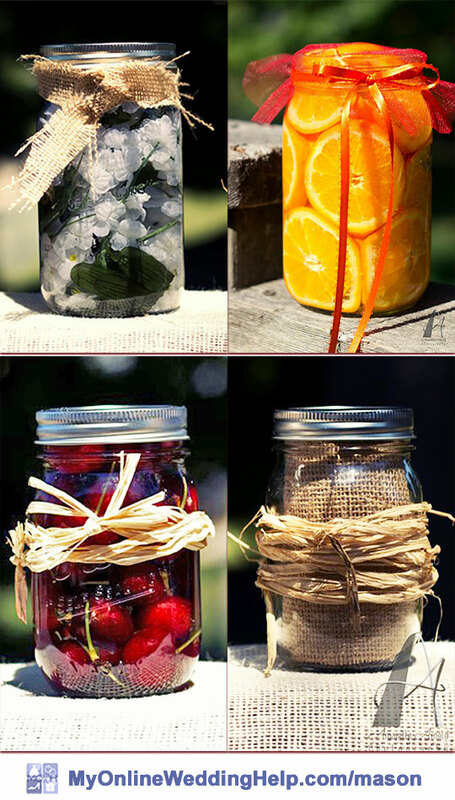 Consider something like this if you want a bit of the “home canned” look for your mason jar decorations. Filling jars with interesting fruit, fabric, or flowers and tying ribbon, raffia, burlap, or other fabric around the lid or jar is a relatively easy way to add a lot of color or texture to your table decor. Get even more creative with your own ideas and create almost any kind of impression. Top and Bottom Left: We strategically placed orange slices against the glass, added whole fruit in the center to hold the slices in place, and filled plain water. You can use other fruit, such as fresh cherries like we did on the bottom left, or another that goes with your wedding theme. Top Right: We stuffed a garland of artificial flowers with leaves into the jar and filled with water. Bottom Right: This is simply a rolled up square of burlap. Painting clear glass jars completely transforms them. And the beauty of it is, unlike the color on pre-made vases, paint is so versatile. You can have your choice of a myriad results, depending on what or how the paint is applied. Top: Distressed paint can create a look appropriate for country- or beach-theme weddings. Here Missy has created a beach-appropriate color scheme using four quart size mason jars. She sells metallic and other color painted mason jars as well. Center Left: Ashley painted pint jars to complement burlap & lace decor and purple & white flowers. She sells these in sets of four with or without the flowers. Center Right: Chalkboard paint has its own unique look and it is no different on jars. Some choose to paint the whole jar. Others prefer only part, for a sign-like effect. Here, instead of paint, Julie uses chalkboard labels to create the same impression. She sells these jars individually, and you can buy as many or few as you need. Bottom: Apply gold paint and the jars are totally transformed. Natasha and David hand make these complete centerpieces: three different-size jars filled with sola and dried flowers accompanied by two 2-8 hour votive candles. If you find it interesting to talk about past events and love reminiscing over photos with friends and family, why not incorporate that into your wedding? These jars as centerpieces do just that. Top Left: Stacy paints these jars to display as a photo frame. She will print your choice of photo for each quart jar and put them inside. Buy the jars without photos for a cheaper price. You can choose from seven different frame shapes and 17 different colors. These also include a tag tied around the top, which you can use as table numbers or to write a short message to guests. Read more information here. Top Right: These half gallon jars from Mackenzie are similar to Stacy’s but larger and with different detailing. Consider these as a vase for centerpiece flowers (No water, of course). Choose from a little different selection of frame effects, plus nine colors of tied ribbon or twine around the top. Bottom: This is my simple DIY version, which includes clear glass jars. I used all quart mason jars, but you can mix it up with pint or smaller jars to accommodate other size images. You could also decorate the tops with cloth or glue rhinestones around the necks of the jars. Glitzy and messy are two words to describe glitter. The process of using it can be a challenge, but the end results do not have to shed the stuff. 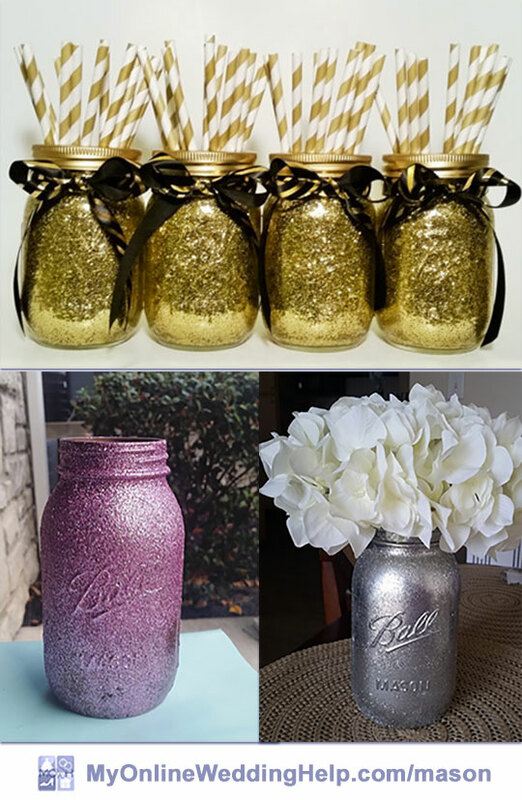 If you would like to create your own glittery mason jars, check out the DIY glitter bottle technique in the 5 Favorite Gold and Glitter DIY Wedding Tutorials post. Top: Krystal uses a four-step process that results in two thick coats of sealed glitter inside the jars. These are a set of four black and gold jars, but you can order custom color or larger size jars (straws are optional). Bottom Left: Jessica applies an adhesive to the outside of her jars, then embeds glitter. She sells pink glitter quart jars individually. Bottom Right: Jessica also makes silver glitter mason jars as well as gold. She will create half-and-half painted and glittered versions as well. You are welcome. Your painted jars are adorable! Hi, my brother is getting married in August 2019 Rustic theme. How much do you charge for your jars with pictures and the colored jars. The Lord has blessed you with an amazing talent, you share you beauty with others. That is great. – Missy sells both the distressed jars at the top of the photo and the gold painted ones for different prices here. – Ashley sells the purple burlap and lace mason jar here for $7.99. – It looks like Julie no longer lists her chalkboard jar, but you can message her here about it. 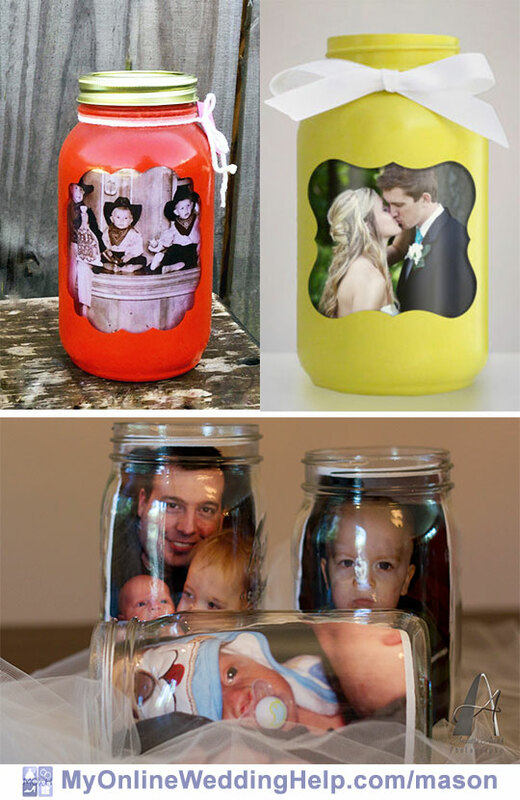 – In the image of mason jars with pictures, the bottom one is just photos printed out and put in jars. – Stacy painted the shiny red/orange jar. As you can see here, she focuses more on distressed and rustic styles these days. But it’s likely she’d do a custom order for you. – Mackenzie charges $9.00 for the large yellow mason jar here.